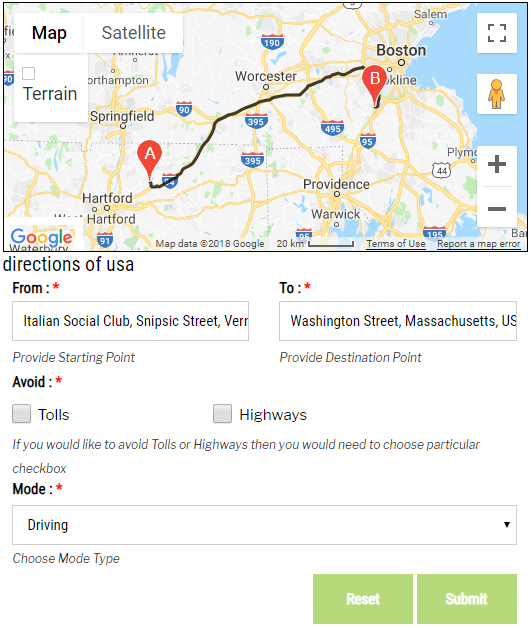 Google Maps Bank create Interactive & Custom Maps for your WordPress Website with multiple Locations, Layers, Info Windows, Store Locators & Directions, which helps people reach their destination and find their way in minutes! Why to use Google Maps Bank? Google Map Bank is the best way to explain a location to your customers so that customers being able to find you. It saves your time and spares your customers & employees from a lot of efforts & trouble. Google Maps Bank makes easy for customers to access your information right when they need it. It provides more information to your customers with less efforts. How to Configure Google Maps Bank? Simply go through the series of steps to configure Interactive Google Maps on your website. Google Maps Bank is one of the most popular responsive plugins that provides a lot of features, which makes it an ideal choice for your WordPress website to look great. 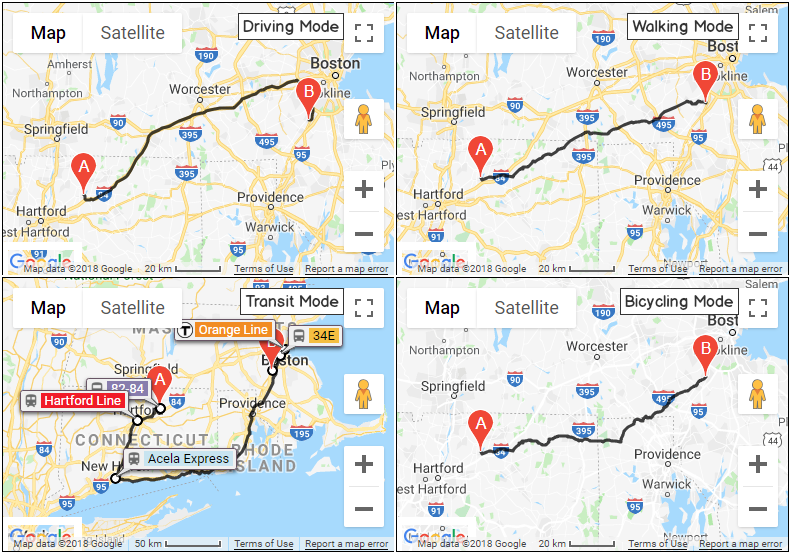 Users can get the routes of different locations or places. 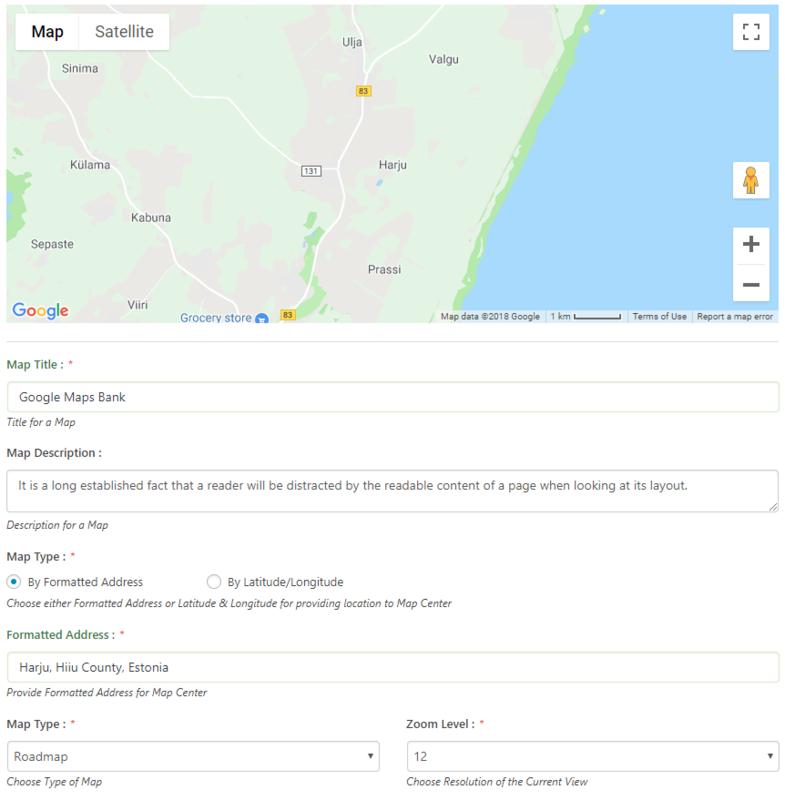 With Google Map Bank, you can create interactive maps as needed on your website and customize each map with different settings. You can set location on a map either by Formatted Address or Latitude & Longitude. 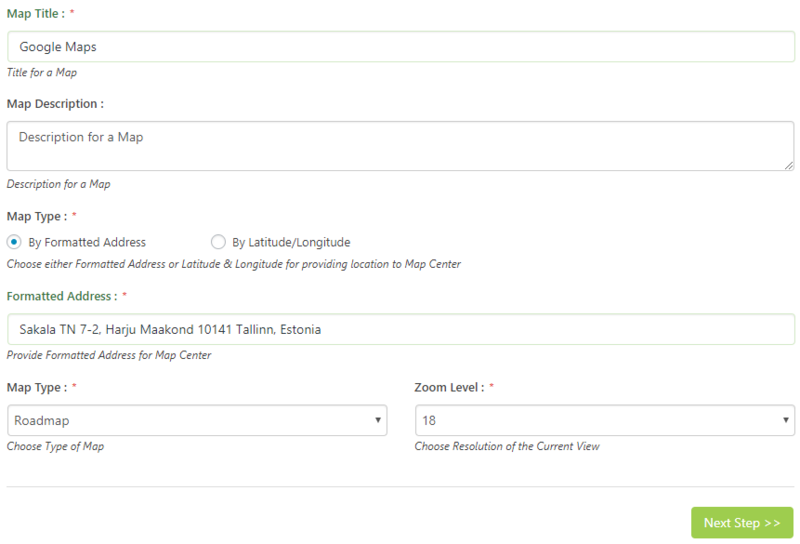 Formatted Address automatically generates latitude and longitude depending on the location. Do you want to indicate certain places on the map to make it more visible to users? Google Maps Bank gives you an advanced feature to highlight & indicate the specific area on a map through mouse click using different overlays. Enhance the map overlay features by using the shape customization options, such as selecting colors, transparency, stroke weight, & many more. Feel free to mark your spot, so to speak. With the help of Google Maps Bank, you can display different layers on a map so that you can make navigation easier for your customers. When you enable Bicycling Layer, Transit Layer or Traffic Layer from the settings, you can see bike paths, public transport network or traffic information on the map respectively. Store Locator is another major feature of Google Maps Bank. 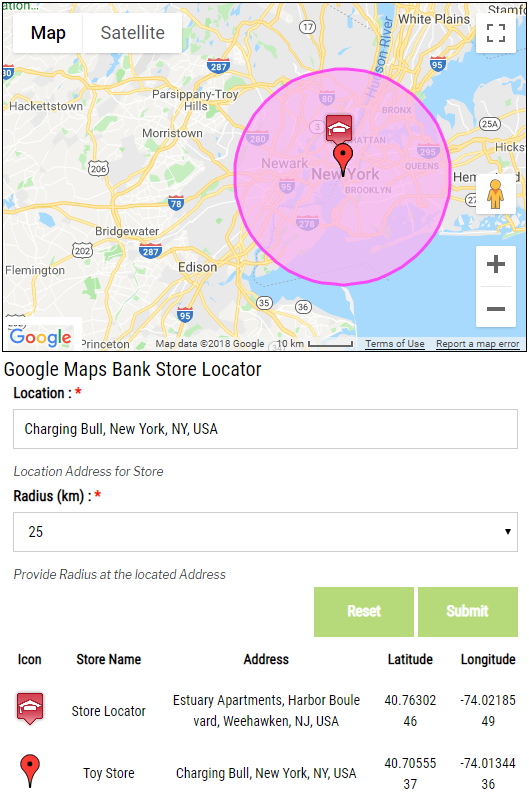 Besides the simple options that allow you to create an interactive map for your website, it shows the location of your all stores to the customers. You can also add Marker Icon to the store locator of your own choice with different animations. You can also provide a measurement unit for distance in miles & kilometers. Google Maps Bank provides direction services through which the user can get the routes of different locations or places. User must set source & destination location to get detailed information about the route. Google Maps Bank shows you the four different modes of directions such as Driving, Walking, Transit & Bicycling. You can also perform style customization on directions like background color & opacity of direction window. Google Maps provide info windows that display the content on a map in a popup window. The content provides information about a location on the map. You can select the action to open Info Window either by mouse hover or mouse click. 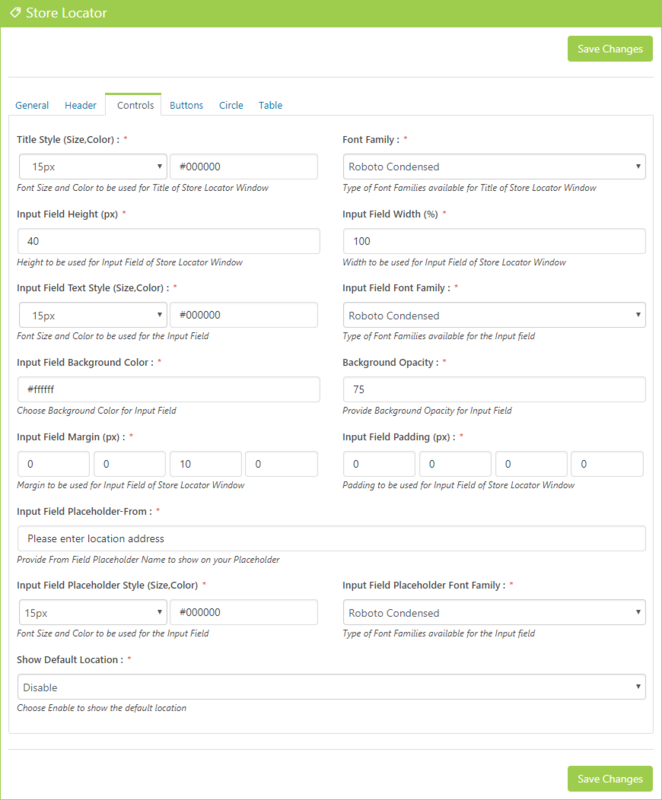 Different options are available to customize the Info Window, and these are Info Window width, text styling, image & text padding, etc. Google Maps Bank allows you to choose your mode for travel. It will give you directions according to your chosen mode. Using this, users can view the traveling routes for locations on a Google Map based on their mode of transport. Google Maps provide different map types to view the map in different views. Every Map type has its different visual behavior. Road Map displays the 2D view of the road while the Terrain Maps displays the terrain information such as rivers, mountains etc. In Satellite View, it displays the satellite images of Google Earth. Hybrid is a combination of satellite and normal view with roads & city names. Using Geocoding, you can easily convert a street address, city & state or country into its geographical coordinates i.e. latitude and longitude. Google Maps Bank allows you to add title and description to the Maps, Store Locators and Overlays. Make them more attractive by providing customization to text, setting alignment, background color & opacity. You can also set the border style, image padding & text padding for the Info window. Overlays are used to mark single or multiple locations on the map. You are free to captions to these overlays to make them more interactive and provide a brief information about the pointed location to the users. Markers are used to identify the particular location on a map. 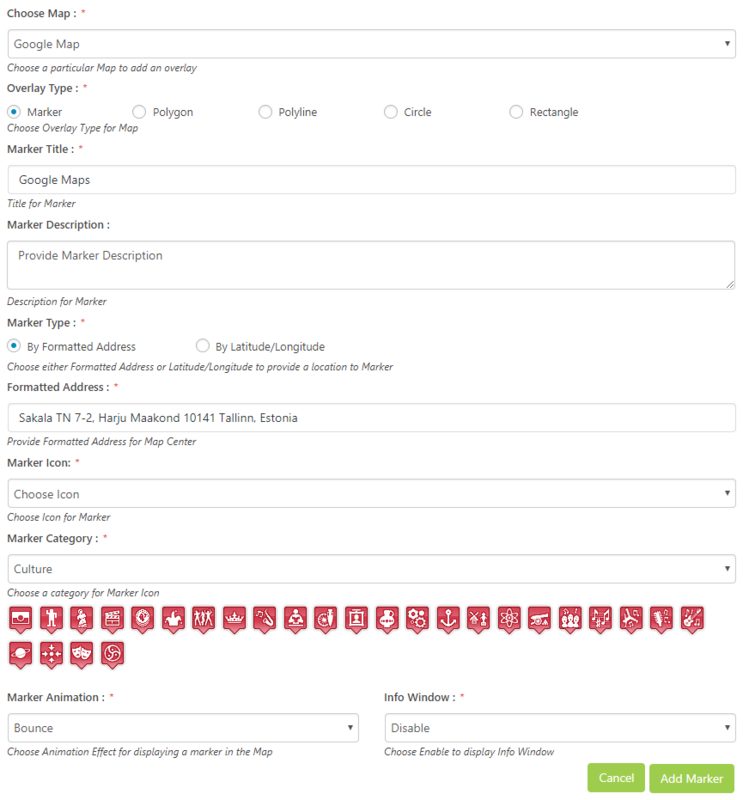 You can choose among different icons, that are available to you in the plugin or you can use any icon of your own choice to mark locations on Google Maps. There are 41 different categories of markers available in Google Maps Bank. Google Maps Bank allows you to upload custom markers. 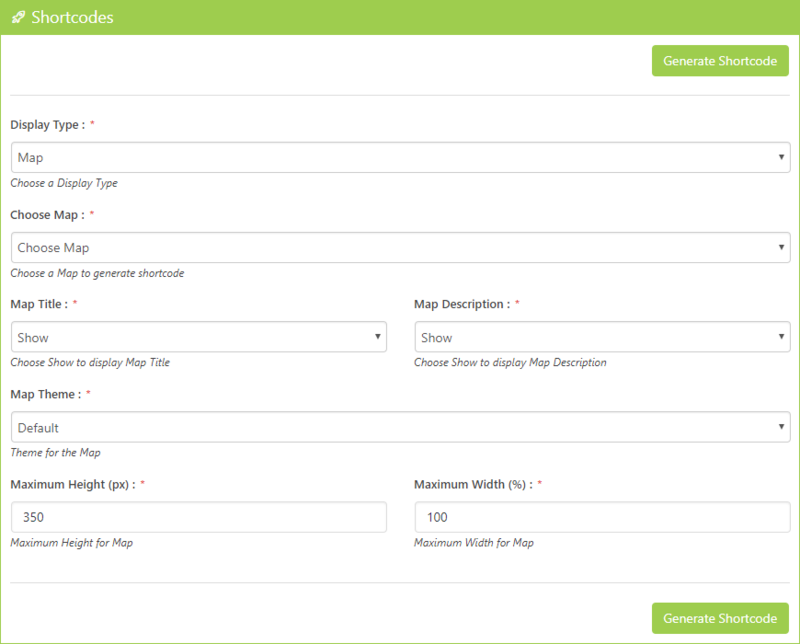 To create a new map on your WordPress site, simply input shortcode on your page, post or widget & display an attractive map with different maps, overlays, store locators, markers. Enhance the functionality of the Google Maps by choosing different themes & setting dimensions for a map. Widgets allow your Google Maps to be displayed in your sidebar or footer and where ever you want it to be! Just copy the shortcode from Google Maps Bank & paste it in the widget section. 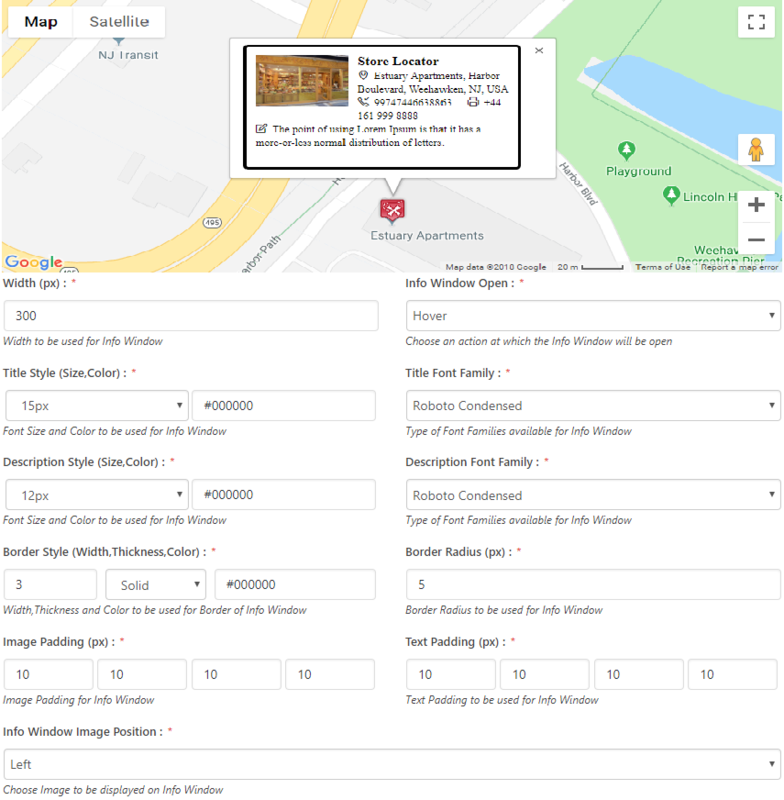 Google Maps Bank provides plenty of Map Customization options through which you can take full control over the extensive set of default options. Do you have a question about Google Maps Bank? See the list below for our most frequently asked questions. If your question is not listed here, then please contact us. On How Many Sites Can I Use Google Maps Bank? You can install Google Maps Bank on Unlimited Sites. Can I Display Multiple Maps per Page? Yes, you can. 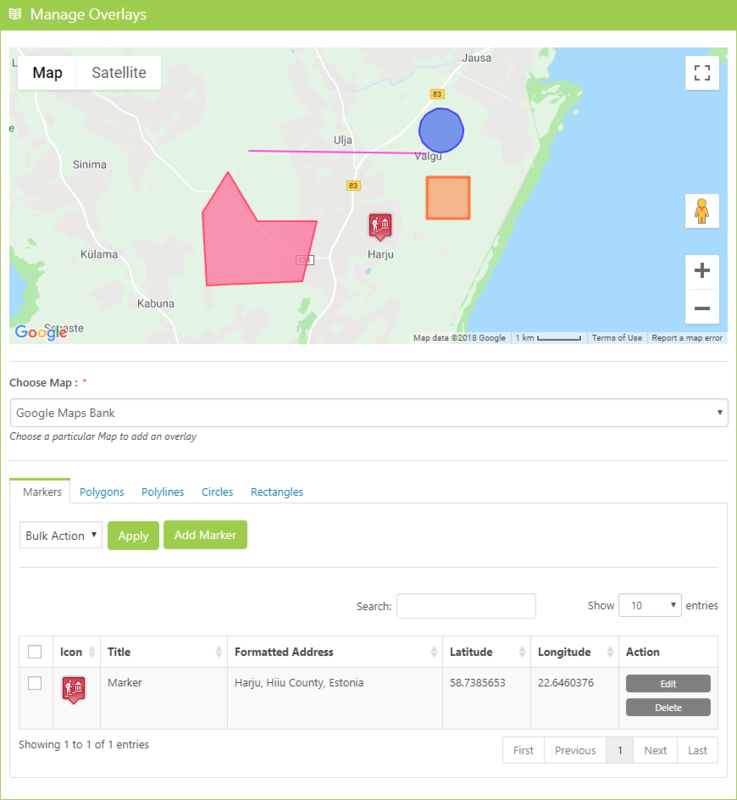 You can create multiple maps and display them all on the same page or post. Are the Maps Are Responsive? Yes, the maps are responsive. 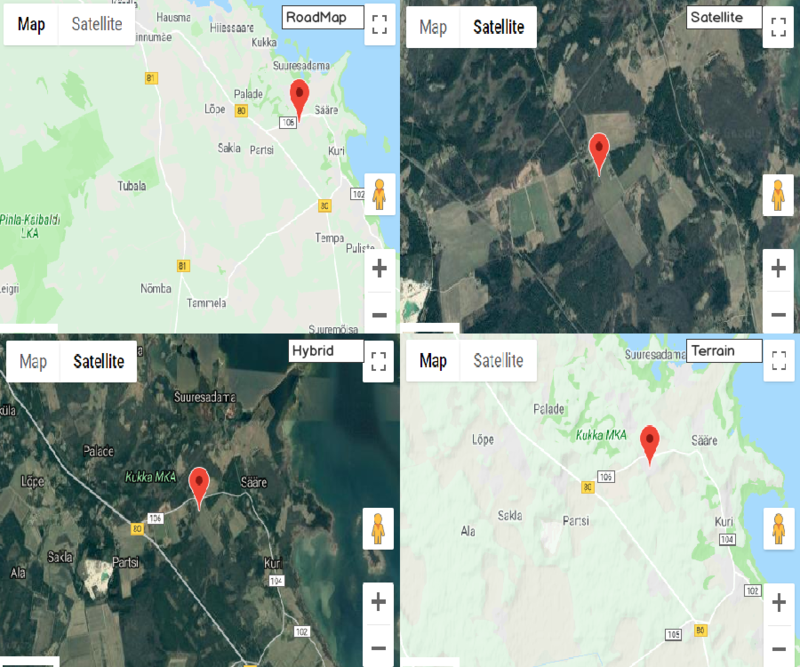 Can I Use Google Maps in Widgets? Yes, Google Maps Bank comes with a widget. 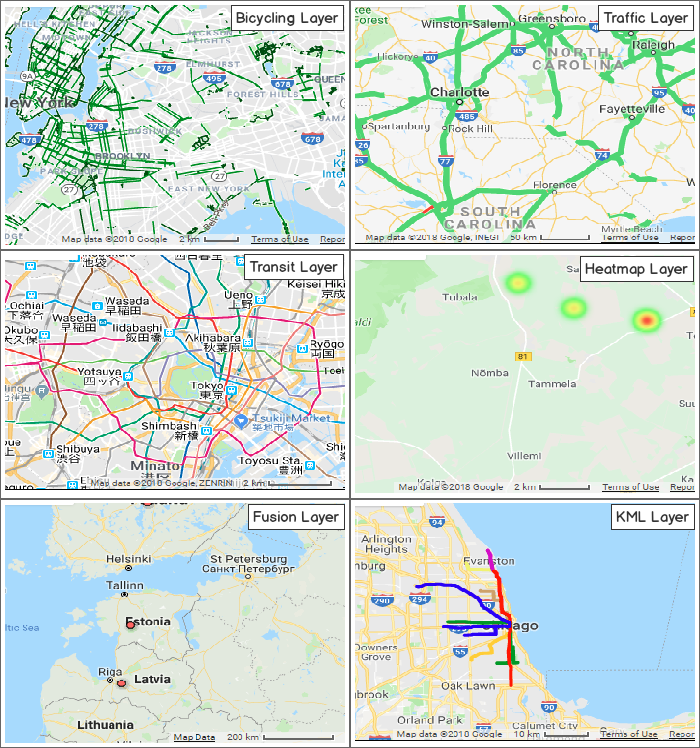 You can insert created Google Maps into a custom area depending on your theme widget areas assigning it to a certain position. You can configure the Google Maps settings and define its dimension. Can I Create a Custom Marker? Yes, you can upload your own marker image or you can choose from the available icons. You will get a notification about the Google Maps Bank in your WordPress Back-End whenever an update is available. You can expect that Google Maps Bank will get improved, optimized, and bug-free plugin every time you will update. Google Maps Bank Pro Edition offers you Full Features, Support & Updates for Unlimited Sites. Google Maps Bank Developer Edition offers you Full Features, Support & Updates for Unlimited Sites with Contact Bank, Backup Bank, Gallery Bank, Coming Soon Booster & Captcha Bank Pro Edition. Whereas Agency Edition offers Full Features with Support & Updates for Unlimited Sites with Captcha Booster, Clean Up Optimizer, Coming Soon Booster, Contact Bank, Facebook Like Box, Gallery Bank, WP Mail Bank & Limit Attempts Booster Pro Edition.